This article contains a summary of the Constitution of America with further access to additional, more detailed information. This selection of articles provide interesting facts and information about the Constitution of America in a simplified format that is ideal for kids, schools and homework. The early history of the Constitution of America is covered first and all the subsequent amendments are detailed according to the dates and the presidencies during which all of the amendments to the Constitution of America were ratified. 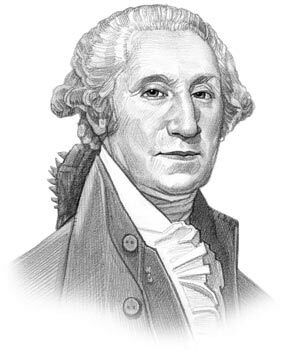 George Washington was the first President of America, who served in office from April 30, 1789 to March 4, 1797. The Constitution of America was adopted just before he became president. The original Constitution of America was put into writing on September 17, 1787 by the Constitutional Convention and is housed in the National Archives in Washington, D.C. The first section provides access to an overview of important historical events that led to the Constitution of America and a simplified overview of the history of the Constitution of America, such as when it was written, when it was ratified, who wrote it, the original text and an explanation and a simplified summary of the content. Constitution of America History for Kids - Learn about the State Constitutions, the Birth of the Nation and the history of the Constitution of America. Definition and where, when and why it was written and who wrote it. Preamble to the Constitution of America - The Preamble, or the introduction, of this important document provides the text and explains the reason and the purpose of its content. US Constitution Simplified - A simple guide to the Constitution of America. 7 Principles of the Constitution - The 7 Principles of the Constitution which provided the foundations for the US government. Article 2 of the Constitution of America - Text, summary, explanation, sections and clauses of Article 2 that deals with the Executive Branch - Administration, headed by the President. Article 3 of the Constitution of America - Text, summary, explanation, sections and clauses of Article 3 that deals with the Judicial Branch - the system of courts and judges. Article 4 of the Constitution of America - Text, summary, explanation, sections and clauses of Article 4 that deals with the relationship between the states and the federal government. Article 5 of the Constitution of America - Text, summary, explanation and sections of Article 5 that deals with how to amend the Constitution, called Constitutional Amendments. Article 7 of the Constitution of America - Text, summary, explanation, sections and clauses of Article 7 that deals with the requirements for ratification of the Constitution. The links provide access to interesting, simplified articles that explain the text and content of each of the first ten amendments together with a very short, simplified summary of what the amendments actually mean. The simplified summaries give easy, simple information for kids, schools and homework. The historical time period and presidencies when each of the amendments to the Constitution of America was approved by Congress (ratified) is also explained, putting all of the amendments to the Constitution of America into the correct time period. First Amendment - Text and summary detailing Freedom of Religion, the Freedom of the Press and Freedom of Expression in the Constitution. Second Amendment - Constitution Text and summary detailing the right to keep a weapon and use it to protect themselves. Third Amendment - This Constitution Text relates to the early Quartering Act with a summary stating that soldiers cannot take, or live, in a person's house without permission of the owner. Fourth Amendment - Constitution Text and summary stating that a person or their property cannot be searched unless there is "probable cause" that a crime has been committed. Fifth Amendment - Text and summary detailing the need for 'due process of the law' before punishing a person and the right to a trial by jury as detailed in the Constitution. Ninth Amendment - Text and summary that states that the Constitution of America does not include all of the rights of the people and the states. The following links provide access to interesting, simplified articles that explain the text and content of each of the 11-15 amendments to the Constitution of America together with a very short, simplified summary and definition of what each of the amendments actually mean. The simplified summaries of the 11-15 amendments give easy, simple information for kids, schools and homework. The historical time period and presidencies when each of the amendments to the Constitution of America was approved by Congress (ratified) is also explained, putting all of the amendments to the Constitution of America into the correct time period. Constitutional Amendments - A summary of all of the Constitutional Amendments. Twelfth Amendment - In 1804 the 12th Amendment changed Presidential election rules in the Constitution. Thirteenth Amendment - In 1865 the 13th Amendment was ratified ending slavery in the United States. Fourteenth Amendment - In 1868 the 14th Amendment was ratified stating that every person born in the US is a citizen. States must follow due process of law before taking away any citizen's rights or property. Fifteenth Amendment - In 1870 the 15th Amendment was ratified stating that a citizen's right to vote cannot be taken away because of race, the color of their skin, or because they were previously slaves. The following links provide access to interesting, simplified articles that explain the text and content of each of the 16-27 amendments to the Constitution of America together with a very short, simplified summary and definition of what each of 16 -27 amendments actually mean. The simplified summaries of the later amendments give easy, simple information for kids, schools and homework. The historical time period and presidencies when each of the amendments to the Constitution of America was approved by Congress (ratified) is also explained, putting all of the amendments to the Constitution of America into the correct time period. Sixteenth Amendment - In 1913 the 16th Amendment to the Constitution was ratified authorizing Congress to collect income taxes. Seventeenth Amendment - In 1913 the 17th Amendment was ratified stating that people will elect Senators. Before this, Senators were elected by state legislatures. Eighteenth Amendment - In 1919 the 18th Amendment was passed banning the sale, production, importation, and transportation of alcohol across the nation. The Prohibition era lasted from 1920 - 1933. Nineteenth Amendment - In 1920 the 19th Amendment was passed which guaranteed women the right to vote. Twentieth Amendment - In 1933 the 20th Amendment was ratified that changed the days for meetings of Congress and for the start of the President's term of office. Twenty-first Amendment - In 1933 the 21st Amendment to the Constitution repealed (overturned) Prohibition. Twenty-second Amendment - In 1951 the 22nd Amendment was made to the Constitution of America stating that a person may not be elected President more than twice. Twenty-third Amendment - In 1961 the 23rd Amendment was made to the Constitution of America giving the people in the District of Columbia the right to vote for President. Twenty-fourth Amendment - In 1964 the 24th Amendment was made making it illegal to make anyone pay a tax to have the right to vote. Twenty-fifth Amendment - In 1964 the 25th Amendment was made to the Constitution of America changing what happens if a President or Vice President dies, resigns, or is not able to do the job. Twenty-sixth Amendment - In 1971 the 26th Amendment to the Constitution was ratified giving 18-year-olds the right to vote. Twenty-seventh Amendment - In 1992 the 27th Amendment was made to the Constitution of America limiting how Congress can increase how much its members are paid. The article on the Constitution of America provides a summary of one of the most important documents in the history of America, the Constitution. The following video will give you important facts and dates about the political events experienced by all of the Presidents of America.